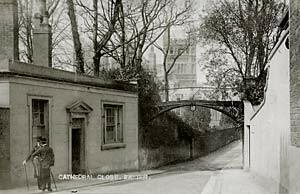 A new cut through the wall was made in 1753 at the site of a 13th-century tower, between Southernhay and Cathedral Close, through which an aqueduct of lead pipe from near St Sidwell's School was routed to a water fountain near the West Front of the Cathedral. The site of this tower was granted in 1281 to Henry De Bollegh, Archdeacon of Cornwall, on an agreement with the citizens that access be allowed for repairing the aqueduct. In the fifteenth-century concerns were raised regarding access and in 1639 the Chamber came to an agreement that access would be renewed on an annual basis. Even during the Civil War, the Archdeacon of Cornwall had to be ordered to allow access to the tower to improve the defence of the city. Every year, on Michaelmas Day, 29th September, after the election of a new Mayor, the Muraltie Walk of inspection of the walls would commence, and the Mayor and dignitaries walk the top of the wall. The tower had fallen into disrepair to be removed leaving an opening with a locked door. The opening was eventually widened to a width that would take a carriage, forcing the Mayor to clamber down and back up the wall on his annual walk. 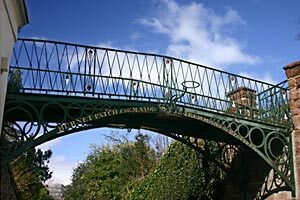 In 1814, Mayor Burnet-Patch found the task of clambering down the wall and back up the other side of the opening rather onerous, so he had Exeter's first wrought-iron bridge erected, to span the gap. James Cossins wrote in 1877 "This bridge was erected on demolishing the wall, the outlet being a doorway. It was locked at night, and the keys kept by the man living at Broadgate, hence the reason of "no right of carriage way to Southernhay." On each side of the bridge in cast-iron (wrought-iron - editor) letters are Burnett Patch, Mayor, R. Trewman, Esq., Receiver, 1814." The street beneath the bridge, was prone to flooding in heavy rain and boys from the Cathedral School had a traditional game in the large puddle, soaking themselves and any spectators. At the time of writing, the drains beneath the bridge have been playing up and the old river cobble roadway ripped up. The City Council have had the cobbles relayed and prevented cars parking near the bridge to make the area more attractive. Sources: Gleanings from the Municipal and Cathedral Records by Cotton and Woollcombe, Reminiscences of Exeter by James Cossins.